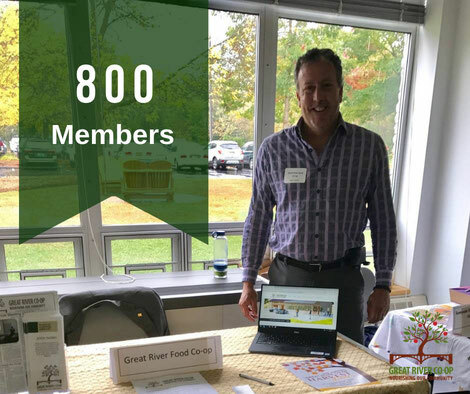 Great River Co-op Reaches 800 Members! The Great River Co-op, a cooperative grocery store coming to Walpole, has reached an important milestone of 800 household members. According to the newly-established Seven Roots Group (a co-op of co-op consultants,) 600-800 members is when a Board should start looking for a site. The Great River Co-op already has its site, on Tedd Benson’s property between Pinnacle View and The Hungry Diner, so the project is on course when compared with other cooperatives. 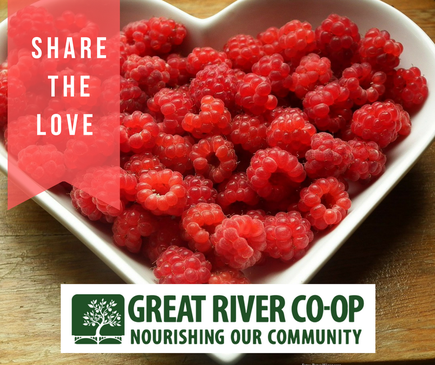 Community members interested in getting more involved in moving the project forward are encouraged to contact Steve Fortier at president@greatriverfoodcoop.com or 603-903-2602. The 2019 Annual Meeting is April 30th! 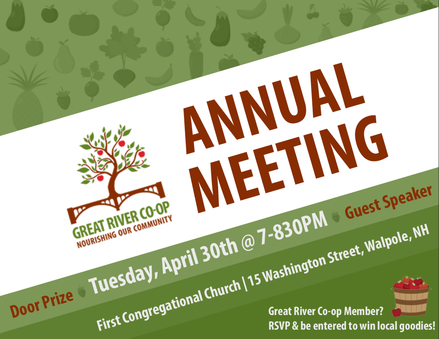 Join us for the 2019 Annual Meeting of the Great River Co-op on Tuesday, April 30th at 7pm at the First Congregational Church of Walpole, at 15 Washington Street. The evening will include a celebration of accomplishments to date, an update on new developments and member input on future directions. Members will receive a ballot to vote for new members on our board of directors either by email or by mail. You will RSVP for the meeting via your ballot. All others interested in attending may RSVP at info@greatriverfoodcoop.com. Share The Love, Get a Tote Bag! Our goal for this month is to sign up 28 members in 28 days! 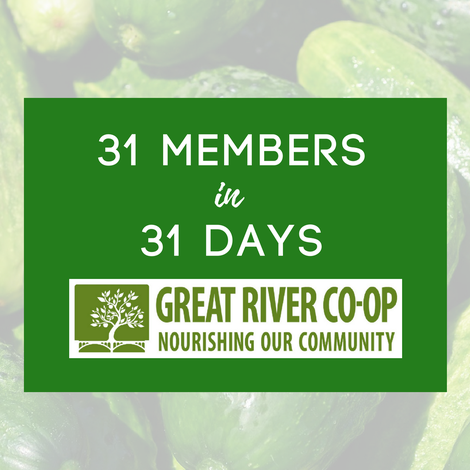 And, we’re offering a Great River Co-op tote bag to anyone who signs up in this 28 day challenge! A single share is $25, and if you buy four shares at $100-you are a voting member. This means you will have a say in what the store looks like, what we carry and more! With the new year comes renewed energy to get the long awaited Great River Co-op facility built, and operations up and running. To help facilitate these developments, the Board of Directors is focusing most of its time and energy on Board Development, including a slight reshuffling of the board’s leadership. After five years as President of the Co-Op Board, Kim Mastrianni is moving to the role of Treasurer. Before moving to Langdon to start a sheep farm, Mastrianni’s career was in finance at some of the nation’s largest multinational corporations. Her move to serve as Treasurer of the Co-Op allows her to focus on refreshing the pro forma operating budgets and determining the investment needs for construction and start-up. 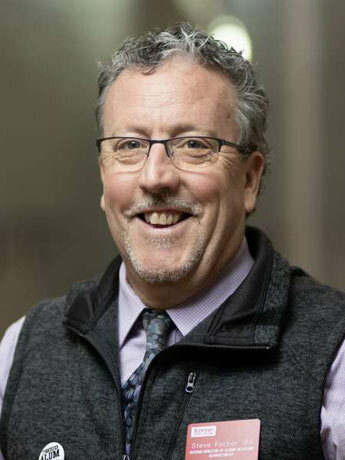 Replacing Mastrianni as the Co-Op’s chief volunteer officer is its founding President, Steve Fortier of Alstead. Join us for the Thanksgiving Farmer's Market! 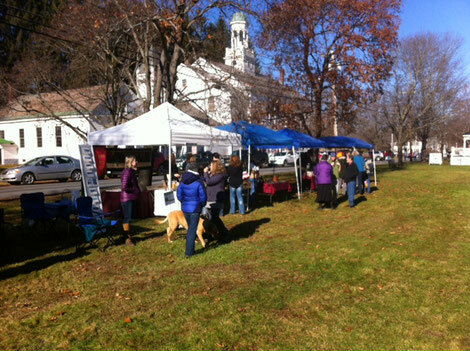 Stop by the Walpole Thanksgiving Farmer's Market this Saturday, November 17th from 9am to 1pm on The Walpole Common to sample some of the best local foods and wares around! We'll have fresh baked goods, local cheese, wreaths and swags, soaps, candles, salves and bath and body items - plus more! There are still tables available as well. Shoot an email to Sean Fortier at Sean@meetingwatersymca.org to reserve your space! 31 Members in 31 Days! We are kicking off an initiative to sign up 31 new member/owners in the month of July! 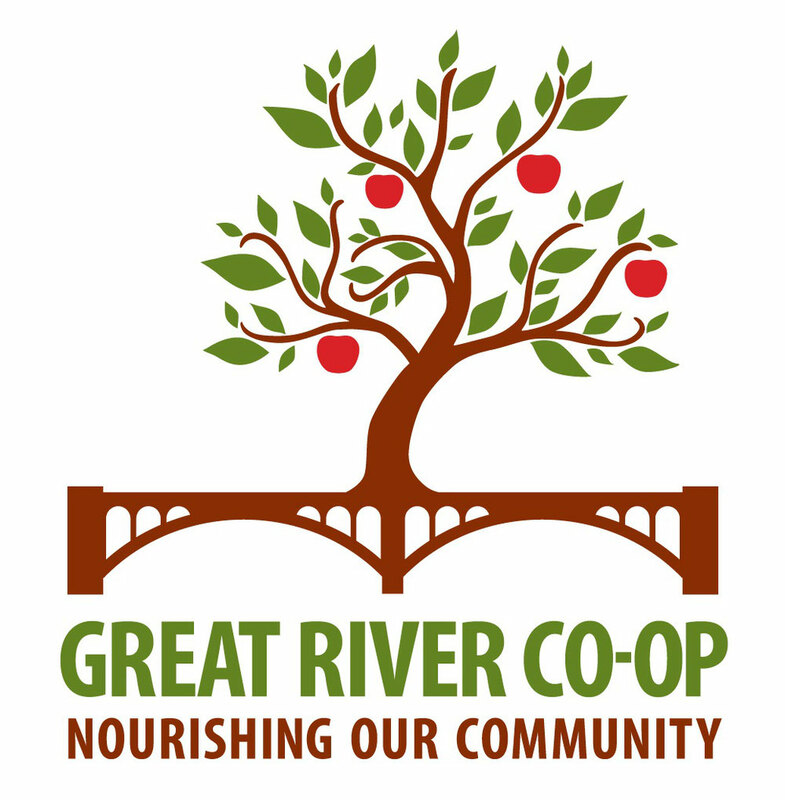 To say thank you for joining, all new members during this time will get a free Great River Co-op Tote Bag! If you’ve been on the fence about joining, why not sign up now? On Wednesday, April 18th The Great River Co-op presented the documentary film Food for Change during is Annual meeting. The event was held at the Bellows Falls Opera House and began with a brief summary of what the co-op has achieved over the last year, and next steps toward opening its doors. Before the annual meeting, the co-op held an online vote to solidify Shannon Latham and Gretchen Markiewicz as board members. Voter response was excellent, and we welcome and congratulate both as new board members! 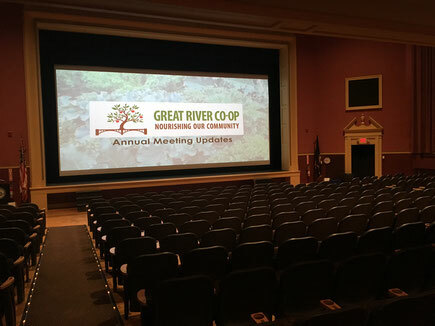 The Great River Co-op, a startup cooperative grocery store coming to Walpole, will screen Food For Change on April 18th at 6:00 pm during its 2018 Annual Meeting. The event will take place at the Bellows Falls Opera House with regular concessions. Tickets will be by donation. 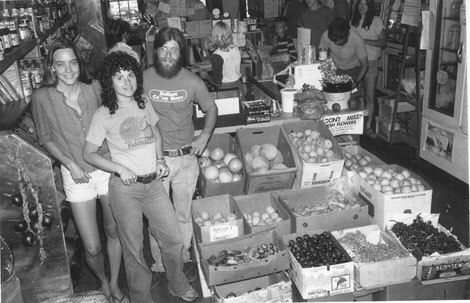 Food for Change tells the story of the cooperative movement in the United States in a way that is both entertaining and informative. It includes interviews with co-op workers, rare archival footage, and narration by the film’s director, Steve Alves. Alves will be available at the meeting for a question and area period around the film.